Yikes! My hands are on fire from seeding and chopping copious amounts of flaming hot red chili peppers for this Nepalese Eggplant Bhutuwa and Roasted Tomato Achar meal. If I hadn't been multi-tasking to the max, I might have thought to wear gloves but it's way too late now. Note to self: wash hands really, really, really well before removing contacts tonight. 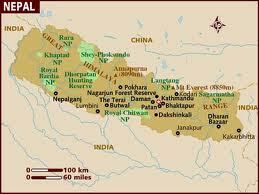 Located in the Himalayas of south Asia, Nepal is a landlocked country bordered by China and India. The country's rich geography boasts 8 of the world's 10 tallest mountains, including the highest point on earth, Mount Everest (or Sagarmatha in Nepali). In the southern regions of the country, the climate is humid and the soil fertile, drawing people to it's more urban environment. More than any other country in the world, Hinduism is practiced in Nepal. Buddhism, although a minority faith in Nepal, is intrinsic to the country's culture and belief system. Historically ruled by a monarchy, Nepal established a democratic republic in 2005 after a decade long civil war. Just as the climate, geography and cultures are diverse in Nepal, so too is the cuisine, but Dal-bhat-tarkari (cooked or steamed rice and lentil soup) is eaten through-out the country. In higher elevations where rice doesn't grow as well, maize, buckwheat, barley, millet, roti or chapati are eaten. Finally, condiments in the form of small amounts of very spicy chutney or achar, lemons, limes and chili peppers accompany most meals. Vegetables eaten include: spinach, daikon radish, potatoes, tomatoes and cauliflower. Goat, chicken, water buffalo and fish are eaten, but beef is forbidden. In a large pot of salted boiling water, blanch eggplant for a couple of minutes and transfer to ice bath. In non-stick saute pan or wok, heat oil and ry dried whole chilies and cumin until dark. Add potato slices, turmeric, salt, and pepper and stir-fry until potatoes are well browned and cooked half way. Add garlic, ginger and chilies. Mix well to incorporate into the potatoes. Add blanched eggplant, broth and salt and pepper. ; stir fry for 5-7 mintues over medium-low heat until potatoes and eggplant are tender. Add diced tomtoes and green onions just before removing from heat. Cut tomatoes in half and place cut side down on cookie sheet. Brush lightly with olive oil. Roast in oven for 30 minutes, or until skin is charred. Remove charred skin and reserve flesh in a bowl. In a sauce pan, heat oil. Add cumin and mustard seeds; fry for 30 seconds. Add chilies, garlic, ginger, coriander, lime juice and salt; stir for a minute. In a blender, combine roasted tomatoes, chopped cilantro and mint and spice mixture; process to for a smooth mixture - or, leave slightly chunkier texture if desired. For garnish, in a non-stick pan, heat one tablespoon of oil and saute fenugreek until it turns dark. Add slices of garlic and fry till light brown. Pour the garlic-oil mixture and chopped green onion over tomato mixture. Mix well and refrigerate for at least two hours before serving. Final Assessment: This was a delicious, beautifully scented and colorful meal. It's very hot, so if you can't take the heat of tons of garlic, ginger and red hot chili peppers, you may want scale back the proportions to make a milder version. Regardless, this dish is both satisfying and filling. Served along side basmati rice and roti, this Nepalese meal will not disappoint even the most die hard meatatarians.